Phoenix Imaging distributes and sells lenses from Fujinon, Kowa, Moritex, Navitar, Pentax, Rainbow and Tamron as well as specialty lenses (Telecentric lenses) from several other manufactures. Whether your company is small or large Phoenix Imaging offers competitive prices on all lenses that we sell. If you don't see the product that you are looking for on this site, ask us if it is available and we will get you competitive pricing. Phoenix Imaging offers a wide selection of machine vision lenses. These lenses are designed for the exacting requirements of machine vision applications. They are designed for flat field high resolution applications. The focal length range extends from 3.6 mm to 100 mm. A large percentage of these lenses are designed with small diameters to fit in restricted areas (< 30 mm OD). A few of the most popular lenses are illustrated on this web site and may be viewed by depressing the buttons to the left. If you need a lenses that is not illustrated please drop us a note and will attempt to locate the item for you. 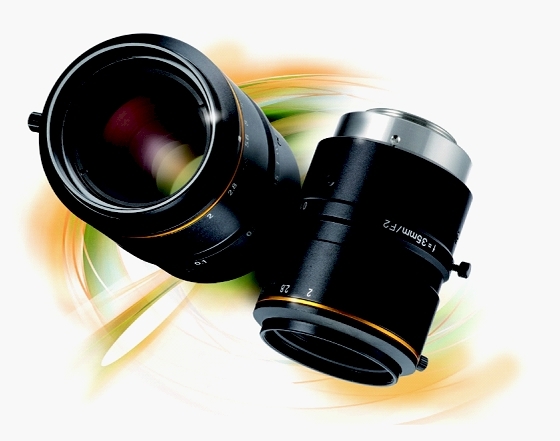 The CF, HF-SA and HF machine vision lenses are manufactured by Fujinon of Japan. These are among the most widely implemented lenses in machine vision applications. The CF are high resolution 1" format lenses designed for mega pixel sensors. The HF-SA are high resolution lenses designed for mega pixel sensors up to 2/3" format. The HF lenses are the standard machine vision lens for smaller sensor sizes. The CP series of machine vision lenses are designed and manufactured by Pentax, one of the worlds leading optical suppliers. This family of products is designed for cctv and general purpose machine vision applications. They offer excellent quality at a very attractive price point. The XF Telecentric series of industrial telecentric machine vision lenses provide excellent depth of field at very attractive price points. The Family includes 65 mm to 200 mm working distances with or without coaxial lighting options. These are generally not stock lenses and are manufactured to meet the requirements of a specific application. The LM series of machine vision lenses are industrial grade designed for harsh environments (vibration) and offer locking screws. These lenses are produced by Kowa a leading manufacturer of industrial and professional grade optics in Japan. Most products in this family offer continuously variable apertures. The all metal construction insures many years of service. This family offers an exceptional price / performance ratio. New LM-HC series of Kowa mega-pixel machine vision lenses for >5MP sensors has just been released and are now available. This series of lenses is all metal construction with locking screws and optics designed for large format sensors. The data sheets for this product line will be added to the website shortly. The LN series are precision machine vision lenses manufactured by Tamron and are available in 2/3" and 1" formats. This series is available with or without locking screws. All Glass and metal construction make this family a rugged industrial partner. The ML series of lenses are produced by Moritex Corporation of Japan. Moritex offers a extensive range of machine vision components for front-end optics and machine vision lighting. The lenses represent a small portion of the Moritex catalog of machine vision components, of which the lenses are presented in this section. The MML-HR series of Telecentric Lenses from Moritex are available in 65 mm, 110 mm Working Distances with and without coaxial illumination. The MML-HR series supports mega pixel CCD sensors and ultra-high image quality. Moritex's MML-ST series of Telecentric Lenses are available in 40 mm, 65 mm, 110 mm, 150 mm and 300 mm working distance. These lenses are generally not stock items and are ordered to meet exact customer requirements. Navitar designs and manufactures the Precise-eye, Zoom 6000 and 12X Zoom Lenses. These high quality lenses are designed for high magnification factors. They are designed as long working distance microscopes and offer motorized para-focal zooms. Phoenix Imaging stocks over 100 different lenses for immediate shipment. Please contact the office for the latest price and availability. Machine builders and OEM customers please ask for a bid on volume pricing. 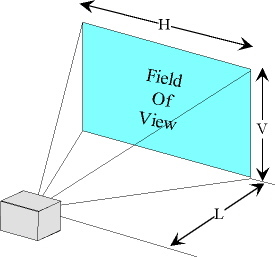 There are a couple of very simple lens focal length calculations for an approximate field of view (FOV) and working distance (distance from camera lens to object). Note: All dimensions should be in millimeters.